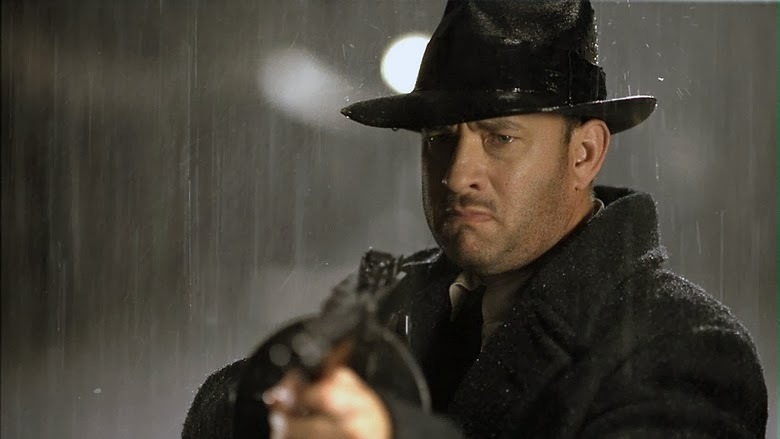 There is something strangely amiss about Sam Mendes' "Road to Perdition" that prevents me from calling it one of the year's best films, and I'm not even sure what that one thing is. No, it's not the premise nor is it the resulting story that builds from it. No, it's not the casting or the acting. It certainly isn't the cinematography or film editing, either; in fact, those two elements are so plausible and effective here that it would be easy to justify the movie getting major Oscar nominations. The more I think about what so irked me about this interesting and well-crafted drama, the more it frustrates. In either case, it's obvious that when one sees this long-awaited vehicle starring Tom Hanks and Paul Newman, chances are they will admire what they see, even though they'll hardly be completely absorbed. The movie's material is probably already familiar with most of the target audience. Based on a graphic novel by Max Allan Collins and Richard Piers Rayner, "Road to Perdition" is a father/son story set amidst the well-hidden but dangerous atmosphere of organized crime in Chicago, circa 1931. The story is centered on Michael Sullivan (Tom Hanks) and his son Michael Jr., who are more like passive acquaintances rather than relatives to each other until a life-shattering event triggers instincts into high-gear and forces them to rediscover one another for the sake of surviving. As both a character study and period piece, the movie is rich in its detail and subtle in its delivery. And yet as the lushly engaging tale unfolds and takes us down several different roads, you can't help but feel that the journey is missing a crucial road stop. Hanks plays the at-first-mysterious Michael Sullivan, a sulky and distant family man who has two sons, Peter and Michael Jr., and a lovely wife (Jennifer Jason Leigh) waiting at home for him. As the movie opens, the whole family hops into the family car to attend the wake of a recently-deceased family friend, whose death is somewhat of a fundamental mystery to those who are intrigued by it. "May he get to heaven an hour before the devil finds out he's dead," announces his former boss John Rooney (Paul Newman), the apparent glue that holds all these families and friends together. Later, when the deceased's brother makes a brief speech in memory of his sibling, too much liquor lowers his guard and he begins rambling on about how Rooney owns the whole town. Quickly, he is silenced and sent home away from the gathering before anything else is said. The root of the story is not in Michael himself, but rather his older son, Michael Jr., who watches curiously from a doorway as his father packs away a gun after getting home from work, wondering exactly what kinds of business his dear daddy is involved in. All that is ever said of the inquiry is that his father owes a lifetime of debts to old John Rooney, the seemingly harmless old man whom he is employed with. But Jr. wonders with further angst at what that employment actually involves. The boy's curiosity leads to him hiding in the back seat of his father's car when he and Rooney's son, Connor (Daniel Craig) go out to "take care of business." What Michael Jr. sees as a result provides enough jolt to shatter any pretense he had about his father, and when Mr. Sullivan realizes what his son saw, the dangerous life he leads turns right back around and bites him. The movie was directed by Sam Mendes, whose claim to fame thus far has been one single other directorial effort named "American Beauty." That film, needless to say, is garnered as a masterpiece by its critics, and although it isn't a movie lasting enough to truly be called a classic, it assuredly had some kind of impact. Like that endeavor, "Road to Perdition" is a quiet, refined and rather staggering triumph in script writing, in which only bare necessities are conveyed to harvest a positive response from the viewer. The material is never overblown nor heavily stressed, and when mere syllables are uttered between characters during crucial scenes, we understand why less is more. From an actor's standpoint, "Road to Perdition" is not simply well cast, but brilliantly acted by a large number of talented stars. Hanks is solid as a father who doesn't realize how caught up he is in fate until it's too late to turn back, while the young actor Tyler Hoechlin is endearing as a kid whose curiosity leads to both danger and discovery. Newman, meanwhile, is mesmerizing and unforgettable as a compassionate Irish mob boss, and Daniel Craig, who plays Rooney's son, is reaffirming as a deadly man whose outer shell will crumble if he isn't careful about his steps. Ironically, Jude Law is actually the finest thespian this movie has to offer; playing a twisted photographer of cadavers who is hired by Frank Nitti to eliminate Sullivan, he is merciless, shallow, vindictive and disturbing, qualities which Law seems to embody so well since he was in "The Talented Mr. Ripley" a few years back. But what is the movie truly trying to say? Does it want us to reassess the relationships we have with our fathers or sons? Does it want us to change the potential outcome of our lives? Does it want us to wrestle with personal destiny? Or better yet, does it want us to do all these things? Hopefully the answer will come easier to you than it did to me.